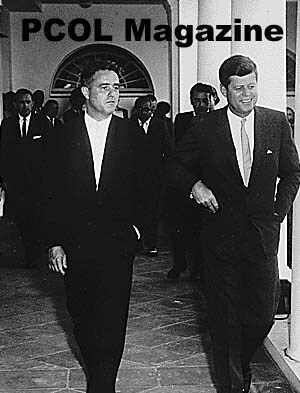 Boston, MA — The John F. Kennedy Presidential Library and Museum today announced that it has processed and made available for research the personal papers of R. Sargent Shriver, brother-in-law to President Kennedy, and a man who offered this country decades of public service as the first director of the Peace Corps, as the first director of the Office of Economic Opportunity, and as United States Ambassador to France. The collection also covers Shriver’s role in John F. Kennedy’s 1960 Presidential campaign, his 1970 bid for governor of Maryland, his 1972 campaign for the Vice Presidency (when he was the Democratic Party nominee), and his 1976 campaign for the Presidency. The papers, a collection of approximately 200 feet, span the years 1948 to 1976, with the bulk of the collection dating from 1955 to 1972. Included is never-before-made public correspondence between Shriver and Lyndon B. Johnson, Robert F. Kennedy, Edward M. Kennedy, Peter Lawford, Hubert H. Humphrey, Adlai Stevenson, and many U.S. congressmen, and bishops of the Roman Catholic Church. Shriver’s official biographer, Scott Stossel, wrote that Shriver, "was willing, at times, to dim his own bright star to accommodate the whole shimmering constellation of Kennedys; but in the firmament of history, his star glows with its own inner luminosity — not just reflected Kennedy light." Stossel wrote that Shriver’s own accomplishments "make him one of the major figures of the second half of the twentieth century." Sargent Shriver first met Eunice Kennedy, the sister of John F. Kennedy, upon his return from service in World War II to New York City, where he began working for her father, Joseph P. Kennedy, at JPK Enterprises in Manhattan. Shriver married Eunice Kennedy on May 23, 1953. The couple settled in Chicago, and in 1955, Shriver began directing both the Catholic Interracial Council, an organization established for the desegregation of schools, and the Chicago Board of Education. In 1960, Shriver coordinated the Wisconsin and West Virginia primaries for John F. Kennedy’s Presidential Campaign. When Kennedy was elected, Shriver was asked to direct the Talent Hunt committee to research and find appropriate candidates for top administrative and ambassadorial positions. John F. Kennedy’s election led to what would become one of Shriver’s most important and long-lasting accomplishments, the creation of the Peace Corps. 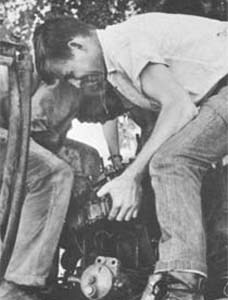 Shriver was asked to work on a report about the feasibility of a volunteer corps that would work on projects in other countries. Shortly after receiving the report, Kennedy signed the executive order establishing the Peace Corps (Executive Order 10924). Shriver served as the Director of the Peace Corps from 1961 to 1966. The Peace Corps materials contains correspondence between Sargent Shriver, his office, and volunteers, staff, and the public about Peace Corps administration and policy, as well as several memoranda to President Kennedy and President Johnson that outline Peace Corps policy. Materials in the Justice Department folders, while not specifically about the Peace Corps, are illustrative of letters written to Shriver because of his connections as director. Other collections housed at the Kennedy Library include the Returned Peace Corps Volunteer Collection, a collection of personal materials that relate to the individual and group experiences of those who served as Peace Corps Volunteers from its inception in 1961 to the present; the personal papers of William Josephson, General Counsel for the Peace Corps; Edwin Bayley, Director of Public Information, Gerald Bush, Special Assistant to the Director of the Peace Corps; Richard Goodwin, Director of International Peace Corps Secretariat; Samuel P. Hayes, social psychologist and consultant to the Peace Corps; Frank Mankiewicz, Country Director for Peru; Kirby Jones, Peace Corps staff in Washington; and the official records of the U.S. Peace Corps. After President Kennedy’s death on November 22, 1963, Shriver continued directing the Peace Corps while also helping to launch President Johnson’s new War on Poverty. Though there was talk that this work would result in a vice-presidential bid for Shriver in the 1964 presidential election, President Johnson chose Minnesota Senator Hubert Humphrey as his running mate instead. On August 20, 1964, Johnson signed the Office of Economic Opportunity Act which would eventually provide job training, work study programs, loans and grants to poor farmers, and a domestic volunteer service that cooperated with local governments and communities. After having spent months laying the groundwork for the O.E.O., Shriver became the agency’s first director. The O.E.O. was quickly dubbed the domestic Peace Corps, and branched into many different programs. Of particular interest in the collection is the information about the passing of the Economic Opportunity Act in 1964, which launched the War on Poverty, and the many programs created by the O.E.O., such as Head Start, Job Corps, Volunteers in Service to America (VISTA), Community Action Program (CAP), Legal Services, the Work Study program, Neighborhood Youth Corps, and Upward Bound. On May 7, 1968, Shriver was sworn in as the U.S. ambassador to France. His job in Paris was not expected to be an easy one, as American relations with France, and specifically with French President Charles de Gaulle, had grown increasingly strained throughout the decade. President de Gaulle had established diplomatic relations with communist China in 1964, withdrawn from the North Atlantic Treaty Organization’s (NATO) integrated military organization in 1966, publicly denounced the American war in Vietnam in 1967, and encouraged French-Canadian separatists in 1968. Despite these obstacles, Shriver and de Gaulle established a working friendship, and the Shriver family became popular and often-publicized members of Paris society. Franco-American relations began to thaw as a result of this friendship, and were furthered when de Gaulle was succeeded by his former Prime Minister Georges Pompidou in 1969. As Ambassador, Shriver was peripherally involved in the Paris Peace Talks which began in 1968 between the United States and Vietnamese officials. He also oversaw President Richard Nixon’s visit to Paris in 1969, which marked the first American state visit to France since 1961, as well as President Pompidou’s state visit to Washington, D.C. in March 1970. Despite his success as Ambassador and his family’s apparent contentment with life in Paris, Sargent Shriver’s thoughts and ambitions were never far from the political scene back in the United States. His correspondence with friends and colleagues touched on various political possibilities, including the 1968 Democratic vice presidential nomination, a nomination for Ambassador to the United Nations, a run for the governorship of Maryland, and Shriver’s consistently strong political potential in Illinois. Upon his return from France in 1970, Shriver founded the Congressional Leadership for the Future (CLF). The CLF functioned as an independent organization separate from the Democratic National Committee, with Shriver serving as the Chairman. The CLF campaigned on behalf of Democratic candidates throughout the country for the November 1970 Congressional races. Shriver, along with his small staff, traveled extensively throughout the United States, particularly where races were thought to be hotly contested, delivering speeches, hosting luncheons and dinners, participating in local community events, and garnering support for candidates. The CLF collected research on the various candidates they were supporting, their opponents, and the relevant political, social, and economic issues surrounding each election. Shriver delivered many political speeches during this short time period that became part of his well-known rhetoric, including "Mature Patriotism: A Turning Point in American History," "The Human Reality of Recession," and "Elephantitis in the White House." In 1972 Shriver ran for vice president on the Democratic ticket along with presidential candidate George McGovern. Missouri Senator Thomas Eagleton was nominated as McGovern’s running mate at the 1972 Democratic Party convention, but Shriver was chosen to accept the position after it was revealed that Eagleton had undergone electroshock therapy to treat depression. McGovern and Shriver lost the general election that November to Republican candidates Richard Nixon and Spiro Agnew. The Library's Archives includes 48 million pages of documents from the collections of 340 individuals, organizations, or government agencies; oral history interviews with 1,300 people; and more than 30,000 books. The Audiovisual Archives administers collections of more than 200,000 still photographs, 7,550,000 feet of motion picture film, 1,200 hours of video recordings, over 7,000 hours of audio recordings and 500 original editorial cartoons. Materials housed at the John F. Kennedy Library have come to the presidential archives through two routes. The first is as Federal records, which come from executive departments, commissions and committees of the Federal government. Access to these materials is controlled by the originating agency. In addition, many of these materials contain national security classified information, which under laws and executive orders must be reviewed by the appropriate agency for possible declassification. Some of the materials, such as civil rights cases or litigation, also have privacy restrictions. The second route is as personal papers, which come from individuals under deeds of gift and deposit agreements negotiated between the National Archives and Records Administration and the donor or his/her heirs. These materials, called "donated historical materials", comprise the bulk of the Library’s holdings. Deeds of gift and deposit agreements cover the administration of the collections as well as the title, literary rights, and any restrictions requested by the donor or necessitated by the nature of the materials. Many donors retain literary rights and/or restrict personal financial or medical information. A review of personal papers for national security classified information also sometimes occurs depending upon the nature of the papers themselves. The presidential recordings are a deeded gift from the estate of President Kennedy. Further information on the collections of the John F. Kennedy Presidential Library is available at www.jfklibrary.org.